As soon as I see eggnog in the grocery store, I know that Christmas is really on its way. My grandmother made the best eggnog I’ve ever had, but sadly I didn’t get her recipe before she passed away a few years ago. I buy some every year and it always brings back fond memories of Christmas Eve at her house surrounded by family and friends. You know… with your crazy uncle singing way too loud, all your cousins running around pestering adults about opening presents – and of course your grandparents who were just so glad you were all there. It showed all over their faces. 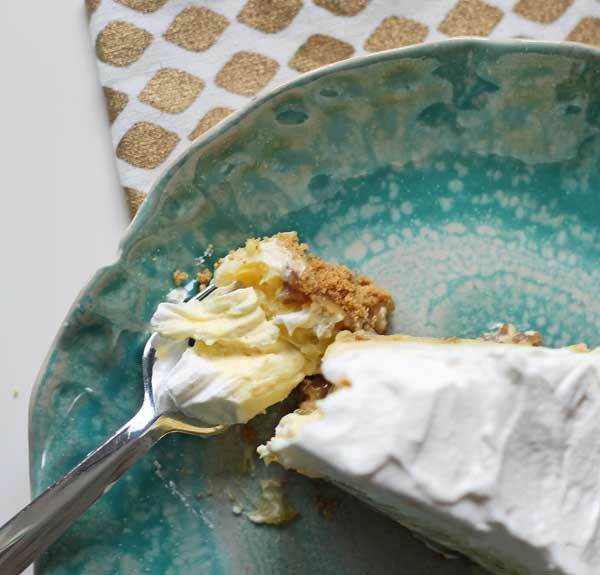 This year I was asked by Kraft to try their recipe for Triple-Layer Eggnog Pie – and it was so unbelievably good that I couldn’t wait to share it with you. It’s like all those childhood Christmas memories came rushing back as soon as I tasted it. 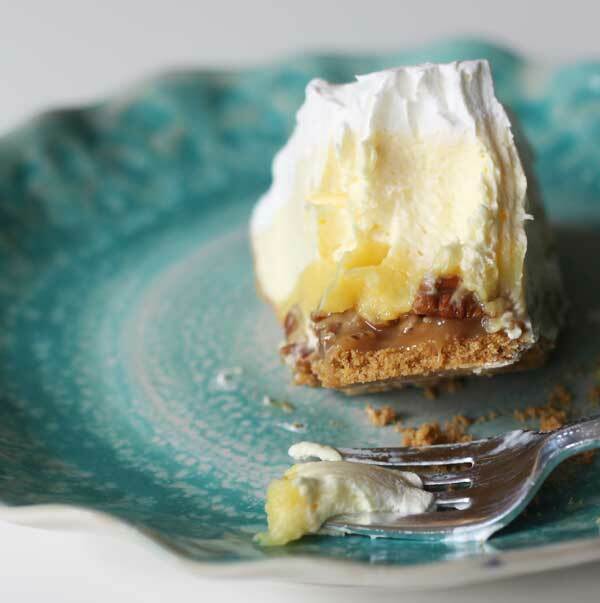 If you’re not a baker, but love making easy desserts, this recipe is truly a winner. It takes very little time to prepare and is really easy to transport for potlucks, family dinners or neighborhood parties. The three distinct layers look so pretty, you almost hate to eat it. Almost. It’s really too good to resist. I’m telling you – if you like eggnog, you’re going to love this one. And even if you think you hate eggnog due to the texture, you might be surprised to find that this pie is super delicious. It’s all of the flavor without the thick texture that some folks dislike about a glass of eggnog. It truly is one that you must try – and it’s so easy there’s no reason not to. Directions: MICROWAVE caramels and 1 Tbsp. milk in microwaveable bowl on MEDIUM (50%) 30 sec. or until caramels are completely melted when stirred. Pour into crust; sprinkle with nuts. BEAT pudding mixes, eggnog and remaining milk with whisk 2 minutes; spoon 1-1/2 cups over nuts. Stir half the COOL WHIP into remaining pudding; spread over pudding layer in crust. Top with remaining COOL WHIP. REFRIGERATE 3 hours. See, it’s super easy! No bake, just a little stirring and you’re good to go. Want to be the most popular person in your ‘hood this year? Share it with your neighbors. So good you can’t wait to share it! Look at those layers. I’m telling you – it’s like Christmas on a plate! 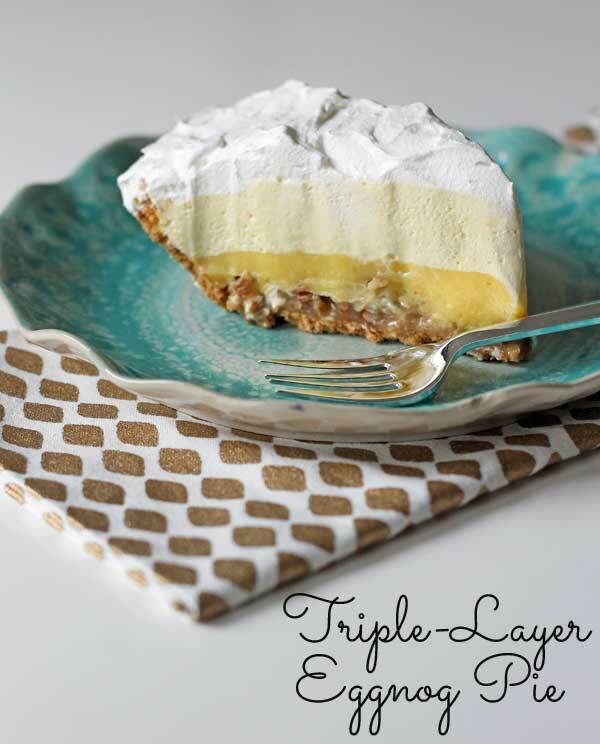 If you make this Triple-Layer Eggnog Pie recipe, I’d love to see a photo of it! Share it with me on my Facebook page or you can snap a pic and share it with me and KRAFT Foods on Instagram (by tagging @shabbycreek and @KraftJello). Microwave caramels and 1 Tbsp. milk in microwaveable bowl on Medium (50%) 30 sec. or until caramels are completely melted when stirred. Pour into crust; sprinkle with nuts. Beat pudding mixes, eggnog and remaining milk with whisk 2 minutes; spoon 1-1/2 cups over nuts. Stir half the COOL WHIP into remaining pudding; spread over pudding layer in crust. Well it looks like I found a recipe to make for Christmas! Not a big fan of nuts so I might omit that part. But other then that this looks so good! Merry Christmas!